DALI Opticon 6 review | What Hi-Fi? If this were a divorce court, the amount of control Dali exerts over its Opticon speakers could lose it a fair amount in damages. “We wanted to be in control of not only the design, development, construction and manufacturing of this speaker series, but also to keep as many of the parts in-house as possible and thereby have an even tighter control over the quality,” it says. 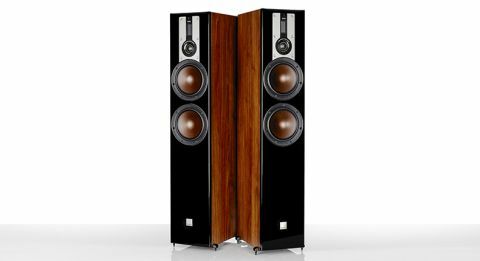 That painstaking concern for detail was rewarded with a four-star review of the enthusiastic Opticon 1 standmounters last year, and we’ve equally high hopes as we lift these similarly distinguished Opticon 6 floorstanders from their boxes. The first thing you’ll notice, having removed the grilles, is an intriguing driver configuration comprising a pair of 16cm dust-cap-free woofers, built in-house using Dali’s wood-fibre composite (the random structure of which helps produce a rich sound and stop build-up of internal resonance), and a combined soft dome and ribbon tweeter module promising wide and even dispersion of treble. The extra bass driver combined with the volume of its one-metre-tall MDF, lacquered cabinet and pair of reflex ports at the rear promises a lot of muscle for your money. Dali asks that you position the speakers parallel with the rear wall, not toed in, to lower distortion in the listening area and aid room integration – besides, that ribbon tweeter is deigned to disperse sound evenly in front of the speaker. Other than that, it is largely a matter of experimentation, but we have ours about three metres apart, and about one metre away from the back and sidewalls of our listening room. We’re in an excitable mood, so we head straight for Yeah Yeah Yeahs’ Fever To Tell album, and evidently these speakers are of a similar state of mind. Eight seconds – that’s all we need of the opening synthesizer motif of Rich to gauge these speakers’ sass, the confidence and energy they exude and how infectious a listen this is going to be. The next eight, our focus is turned to the drums that have now joined the fray, displaying a boldness of which Arya Stark would be proud. That pair of woofers are certainly pulling their weight. Karen O’s vocal retains its characteristic sharpness, but gains from support in the bass and midrange. The bass harmonics of Nick Zinner’s low-strung guitarline anchors the whole piece in uninterested, early-2000s guitar-music cool. There’s no let up in attitude as the pace hastens with tracks like Date With The Night and Pin, and we get a commanding view of the tonal balance of which the Opticon 6 are capable. The lows can rumble and the trebles are rich and soaring, all tied in by an energetic but warm and composed midrange. There are four drivers at work here, but their integration is seamless. At no point do we notice any detachment among the frequencies, which is an achievement in itself. We attempt to catch Dali off guard with Frédéric Chopin’s Nocturne No2 in E-flat Major, but are welcomed only by an equally confident and balanced performance. The Opticon 6s don’t ignore dynamics by any means, but still manage to give an energetic and uplifting rendition of this piece, which can so often be made sound dreary, pedestrian even. It isn’t the most delicate of performances, though nor does it delve as deeply as some competitors into vocal or instrumental expression. However, our main point of comparison here, the Tannoy Revolution XT6Fs, have what the Dali Opticon 6s don’t: extra precision in terms of rhythm and fine detail, greater front-to-back dimensions and the explicit vulnerability of the artist. They don’t have the body or the exuberance of the Opticon 6s, yet are no better or worse for it. The Dalis and the Award-winning Tannoys are going about the same task in different ways – it’s really up to you to decide how you want your music rendered. The Opticon 6s lose a star because they don’t have the insight of their Award-winning rivals, not ignoring the fact they are more expensive. Make a list of indispensible talents for your next pair of speakers, and, if the words ‘bold’ and ‘exciting’ feature anywhere near the top of it, the Opticon 6s could well be the solution for you.